What saree types should you wear on different occasions? Are you looking for a specific saree for a certain occasion? Saree outfits may be universal, but they match various occasions. Many people consider sarees over other types of attire since they are comfortable and easy to find. They also come with different ways of draping them making it easy for ladies to match them for different occasions. While some people wear sarees on a regular basis, designers make some to be worn on specific occasions. Retail shops provide all kinds of sarees from a different material to fit your every purpose. You will find an eccentric collection of sarees designed to match either a formal or casual setting. 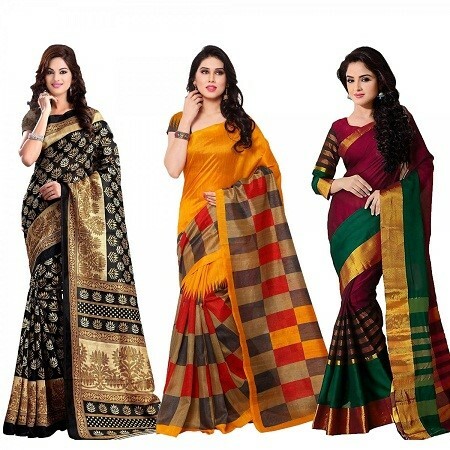 You, therefore, need to know the different types of sarees so that you can choose the right one for every occasion. We will help you out by discussing the various types in detail. Read on! You can attend a traditional Indian festival in a chanderi saree. This type was initially made at Madhya Pradesh. They are created using a specific kind of silk which makes the saree different from other forms. The chanderi saree is also referred to as the luxe sheer saree form. You can get the saree in various designs such as traditional coins, peacocks, floral arts, and geometrics. All these designs are what distinguish the chanderi saree from other forms. You can match your saree with some traditional jewelry and finish the look. Do you need a saree for a special festival? Choose the banarasis saree. This type signifies richness and class as they are made from the silk material. The designers initially made these sarees for royal purposes as they adorned them with accessories such as gold threads and real silver. Banarasi sarees come in beautiful colors and rich textures that make them more expensive compared to other types. This is the perfect saree for bridal wear since they come in heavy embroideries that make them specific for such occasions. You can also get a banarasi saree with minimal embroidery and customize them with your preferred accessories. Feel free to match your saree with some studded earrings and precious neck chains. For your saree to give you good service, you must maintain it well and wear it sparingly. The silk material of this type needs proper wrapping after use away from direct sunlight. Every wedding has to have one or two ladies dressed in kanjeevaram sarees. Most people choose this type as bridal attire. It is popular due to its rich texture, bright colors as well as elegance. You can get a high-quality kanjeevaram saree from Stylecaret. The designers use fine silk to produce a durable saree. It also features some embroidery and colored threads that add to its beauty. The glamorous borders and temple patterns make the kanjeevaram saree stand out from other types. Though the material is durable, you need to ensure that you only use the saree for special occasions and wash it appropriately. You can choose the kasavu sarees to wear every day in an office setting. These sarees look simple and do not come with a lot of details. They, however, feature golden borders to symbolize the traditional culture of Kerala. The outfit often comes in two pieces of garments which cover the upper and lower parts. Indian women wore these sarees to festivals while participating in folk dances. They are now used globally for different occasions including any formal setting. You can match the fabric with some glamorous jewelry. Remember to use a gentle detergent when dry cleaning a kasavu saree so that it can retain its beauty. You can also get an Assam silk saree for a special occasion such as dinner with in-laws or even a conference. The silk sarees are of high quality as the designers use delicate weaving to produce them. Most people like these saree type since it is comfortable to wear for hours and easy to manage. Most sarees in this category come in brilliant colors and alluring patterns that make them ideal for women of all ages. You can get one with intricate patterns on the pallu section to make a fashion statement. If you are looking for a simple saree to wear at certain events, you should consider the chikankari sarees. This type symbolizes elegance and increases the confidence of every wearer as it features glamorous embroidery. In the past, the stitching techniques used in these sarees was only implemented on Muslin cloth. Designers now use the same motifs and floral patterns to make these sarees. You can get a chikankari saree in different fabrics such as silk or even cotton. Ensure that you maintain your saree according to the type of material used in the making. For instance, if you buy a silk chikankari saree, you can dry clean it while a cotton saree needs hand washing. Make your friends jealous during a hangout by getting a paithani saree. The silk material of the saree is handwoven making the attire elegant. You can get such a saree with brilliant designs that make you unique among friends. The pallu of paithani sarees often features natural patterns such as plants birds or even trees. They also come in different unique colors with some single colored while others kaleidoscope colored. Some paithani sarees feature distinctive motifs like akroti, gazwel and asavali. The most expensive sarees in this category come with precious pearls and gems that are rare to find. You can boost the look of your saree by incorporating headgears or beautiful bracelets. The silken threads should be far away from the exposure of sunlight. Do you want to stand out in a family function? The patola saree will leave a lasting impression among the audience. It is a rich saree type which features strong patterns as well as vibrant colors. They have the effect of portraying your personality and boost your confidence. Next article12 Ways To Impress A Boy This Valentine’s Day!